Moto3 and Moto2 round up – Valencia: Oliveira win not enough to stop Kent taking title, Rabat returns for victory. The tension at the Ricardo Tormo circuit was not all for the big MotoGP finale, there was still all to play for in Moto3 too as Miguel Oliveira pulled out all the stops but Danny Kent did all he needed to for the crown. 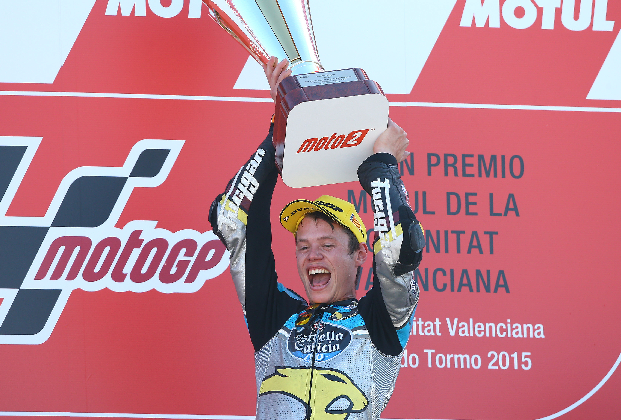 The Moto2 championship may have been decided a few rounds ago, but there were still records up for grabs a great fight at the front and an amazing return from injury for Tito Rabat, winning with style at the Cheste track. Moto3 got proceedings under way with another fast paced tense race, with two pieces of action to watch out for, if Miguel Oliveira could push for a win to keep his title hopes alive to the end and where Kent would finish, needing just 14thto secure the Moto3 crown. At the front the battle was fierce, the Portuguese star often found himself out front but under hefty challenges and overtakes from Romano Fenati, Efren Vazquez and Jorge Navarro. The Red Bull KTM Ajo rider steered well clear of trouble when Ongetta’s Niccolo Antonelli lunged from fifth for a final assault on the podium places only to end his day in the gravel and take Vazquez and Fenati with him. Also avoiding the muddle of bodies and bikes was Valencian Jorge Navarro, in contention all the way to the line at home for Estrella Galicia 0,0 on his way to second. Jakub Kornfeil made the most of the situation and powered home for the final rostrum spot in third for Drive M7 SIC. Brad Binder rode the second Red Bull to take the flag in an excellent fourth ahead of Gresini’s Enea Bastianini in fifth and RBA Racing’s Isaac Vinales in sixth. Pole-sitter John McPhee was a little swallowed up as a train of riders towed past in the opening stages but the determined SaxoPrint-RTG rider was strong and fought back for seventh. The other major factor for the title was Kent’s position on track and the Leopard rider found himself swapping positions with his team-mate Hiroki Ono in a battle for eighth, with no team orders issued. Ono switched between setting the pace to passing to trying to pull Kent forward as the chasing pack approached and in all the position switching finished eighth. Kent took the Moto3 world championship title from ninth, the first British rider to win in any class since Barry Sheene in 1977 and the first in the lightweight class since Dave Simmonds in 1969. Phillipp Oettl put in a late great dash to catch the Leopard pair up significantly on his Schedl GP Racing machine in tenth, ahead of Sky Racing VR46’s Andrea Migno in eleventh and their superb wild-card Nicolo Bulega in twelfth in his first world championship grand prix. The remaining points went to Francesco Bagnaia (Mapfre Team Mahindra) in 13th, Jorge Martin (Mapfre Team Mahindra) in 14th and Alexis Masbou (SaxoPrint-RTG) in 15th. With a great start made by Tito Rabat ended by a red flag after a Hafizh Syahrin’s fall also caught Xavier Simeon, Robin Mulahuser, Xavi Vierge, Marcel Schrotter and Franco Morbidelli (with Morbidelli and Syahrin unable to make the restart) the returning Spaniard had it all to do again as the grid lined up for a second time. A second near perfect start saw the EG 0,0 Marc VDS rider storm ahead, he was reeled in by Alex Rins but the Pons rider fell just short – second however was enough for the same position in the championship. Behind the Paginas Amarillas bike Tom Luthi, the 2014 winner was a clear third for Derendinger Racing Interwetten. Fourth to see the chequered flag was Lorenzo Baldassarri, completing a great final few races for the Forward racing rider, with a brave ride from Sam Lowes seeing him push his way up to fifth for his final ride for Speed Up. Louis Salom found himself in sixth again on the second Pons entry, ahead of our Moto2 champion Johann Zarco, with seventh enough to let the Ajo Motorsport man set a new intermediate points record (352 points). AGR Team rider Axel Pons held strong for eighth, passing Simone Corsi’s Forward Racing bike pushing the Italian back to ninth, Mika Kallio completed the top ten for QMMF. Taka Nakagami finished his season with eleventh for Idemitsu, with Alex Marquez finding his rhythm around the track for twelfth on the second EG 0,0 Marc VDS. Sandro Cortese secured thirteenth for Dynavolt Intact GP, fellow German Jonas Folger 14th for AGR Team and Tech 3’s Marcel Schrotter 15th for the final point.